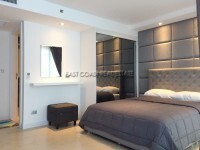 Stunning Ocean View 1 bedroom condo for RENT is located on 25th floor and come fully furnished. Fitted European style kitchen with all electrical appliance. Open plan living and dining areas with flat screen TV. Good sized bedroom with queen sized bed, fitted closet. Modern fitted bathroom with hot water shower. Air-conditioning throughout. Washing machine. Balcony facing to the Pattaya Beach. Centric Sea Pattaya. The prime location on Pattaya Second Road between Central Pattaya and North Pattaya. It is an ideal for those who want a city life. Baht bus routes. Facilities will include 24hr security and key card system, sky pools, sky fitness centers and sky gardens. This unit is for RENT long term contract with 2 month security deposit.